If you have a chance to visit Japan, please come to our GG shop. The GG shop is a store run by Gendai Guitar Co., Ltd specialized in classical guitar. Classical guitar-related goods, such as sheet music, CDs, strings, accessories are always available. Especially, sheet music and CDs of classical guitar are the best supply in Japan. Please search the merchandise in our website. We have become an authorized tax-free shop! We can go through 8% consumption tax exemption procedure for foreign tourists customers. General items: The total purchase amount in a single day is more than ￥5,001 (excluding tax). Items must be taken out of Japan within 6 months since the entry date. Note: Tax-free service is applied separately to the prices of general items and consumable items. It does not apply to the total amount of both items.You can pay by credit card (Visa , Master , Diners , AMEX ) and WeChatPay. 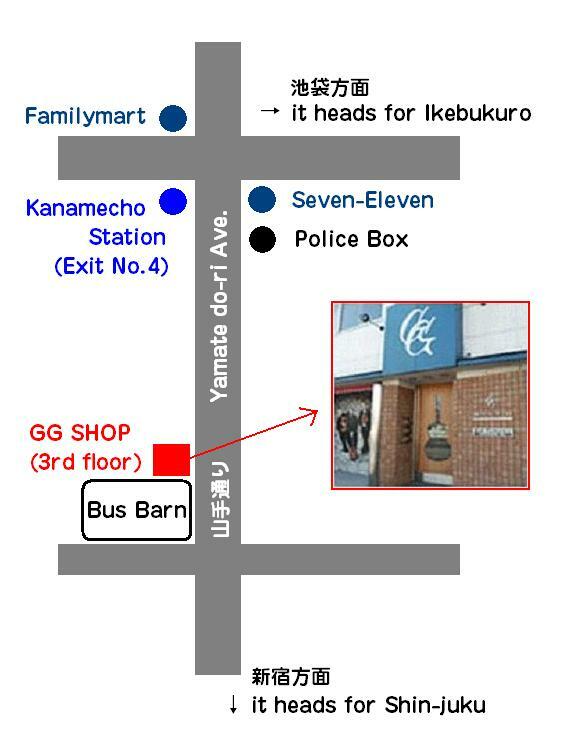 How to find us:　GG shop is 3 minutes' walk from Subway Kanamecho station (Yurakucho-line) or 15 minutes' walk from JR Ikebukuro station. We have no parking lots.